Our FCUK logo is back and more iconic than ever. Yes, you heard it right. We teamed up with Urban Outfitters to relaunch our iconic FCUK logo – and the collection is essentially everything we want to wear all season long. The collection dives deep into the FCUK archives, bringing back classic and bold styles for both women and men, including the cult-favorite bold logo t-shirt and sweatshirt. We celebrated the release of the collection by throwing a raucous warehouse party at Villain in Williamsburg, Brooklyn last Thursday night. Nearly 600 guests were in attendance, including press, influencers, models and industry notables. Partygoers were greeted with VIVA Tequila spiked cocktails, BABE rosé and junk food including burgers, fries and 1,000 slices of pizza. Yes, we said 1,000. DJ duo, Angel + Dren kicked off the evening with a high-energy set, followed by a special live performance by Chicago rapper Saba. 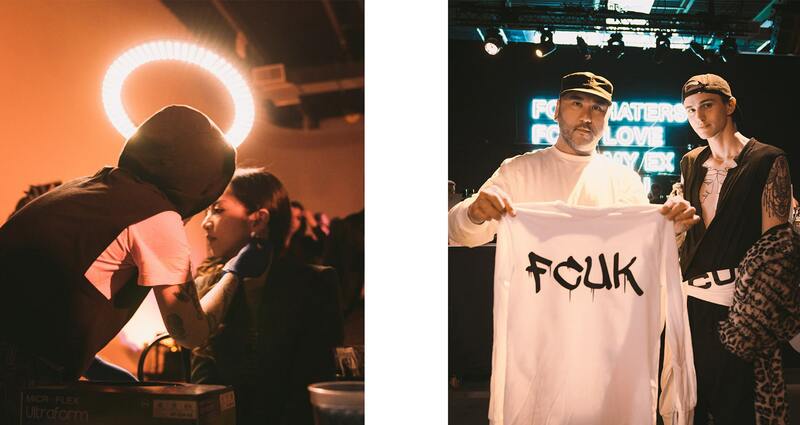 There were several artistic activations on-site that encouraged self-expression, including DIY slogan tees and a pop-up piercing studio – which happened to be a party favorite.